The first 'Nepal-India Think Tank' Summit to foster greater collaboration and knowledge-sharing among the think tanks of the two countries was held in Kathmandu today. Former Prime Minister of Nepal and Co-Chairman of ruling Nepal Communist Party, Pushpa Kamal Dahal 'Prachanda' inaugurated the summit. In his address, Mr. Prachanda said that recent reciprocal visits of prime ministers of both the countries have created a fresh momentum in the overall spectrum of bilateral relations. He also said that initiative of executing all bilateral agreements and understandings has generated a new wave of enthusiasm in Nepal. Delivering the keynote address, Bharatiya Janata Party General Secretary and Director, India Foundation Ram Madhav said that India is committed to support Nepalese Prime Minister K.P. Sharma Oli's ambitious development agenda. Mr. Madhav also said that oceans play a very important role in the development of nations and Nepal can think of adopting 'Look South' policy to access most happening region of Indian Ocean. 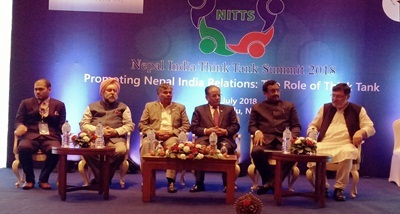 Nepal's Minister for Industry, Commerce and Supplies, Matrika Prasad Yadav and Indian Ambassador to Nepal Manjeev Singh Puri also attended the summit. The summit was jointly organized by the Asian Institute of Diplomacy and International Affairs and Nehru Memorial Museum Library. The participants including think tanks, policy-makers, diplomats, academicians, businesspersons and journalists deliberated on the Indo-Nepal ties and its dimensions in different sessions.